The bidder can choose to make online payment by choosing the Online option in Mode of Payment. The amount to be paid, and the purpose (TDC or EMD) are displayed on the payments page. 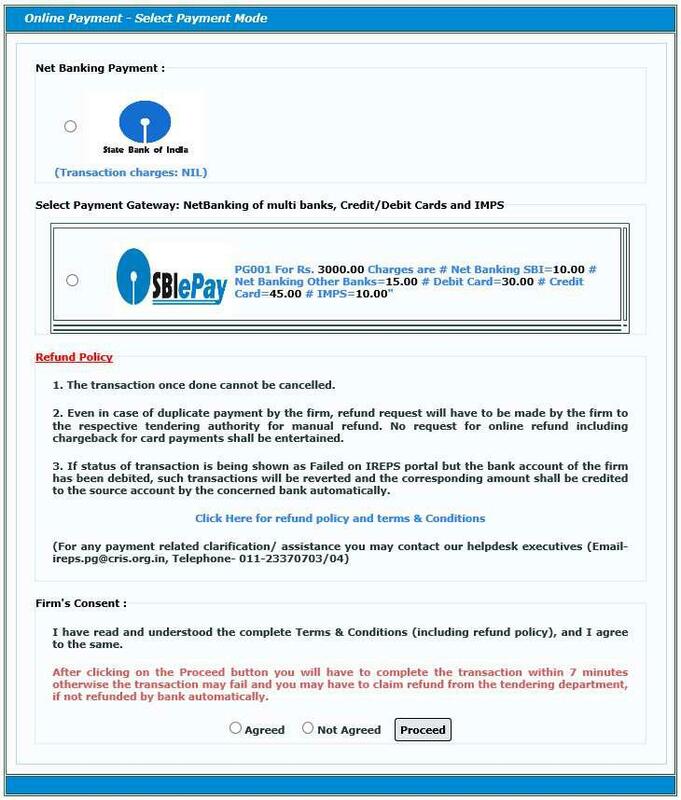 Clicking on the submit button with online payment option selected opens the Online Payment options screen as shown below. At the moment two payment options namely SBI payment gateway, and SBI Net Banking are available. Some more payment options are likely to be added shortly. 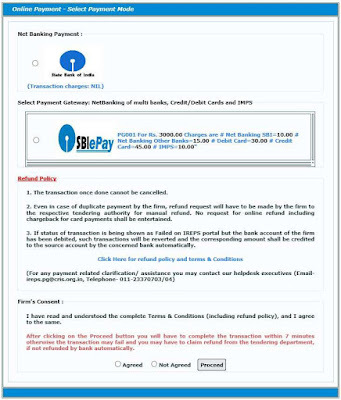 Before proceeding to the selected bank’s/ payment gateway’s website the bidder is required to confirm by selecting the Agreed radio button that he has read the refund policy an terms and conditions applicable to the online transactions. The link for the same is available on the same page. Clicking of the Proceed button redirects the bidder to the relevant payment gateway. The bidder can make payment through various options like Credit Card, Debit Card, Net Banking etc. by choosing the appropriate option in the left pane. 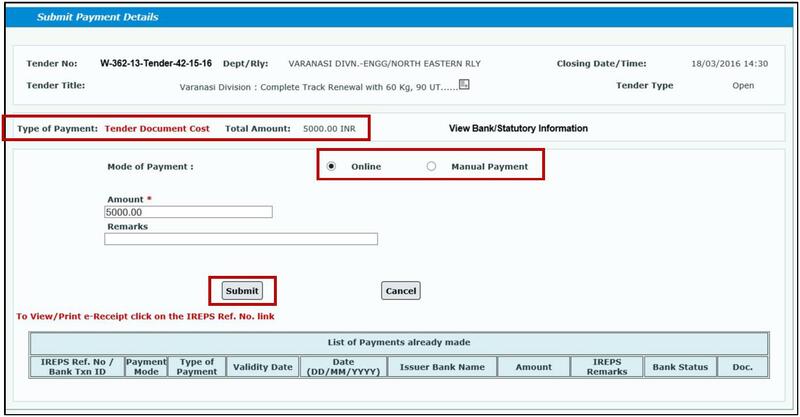 The bank for Net Banking payments can be selected from the dropdown list of Other Banks field. Please click on the Proceed button after making the appropriate choices, and follow the on-screen instructions to complete the payment process. After the payment is made the user is redirected to the IREPS website where the details of transaction made are shown at the bottom of the payment page. 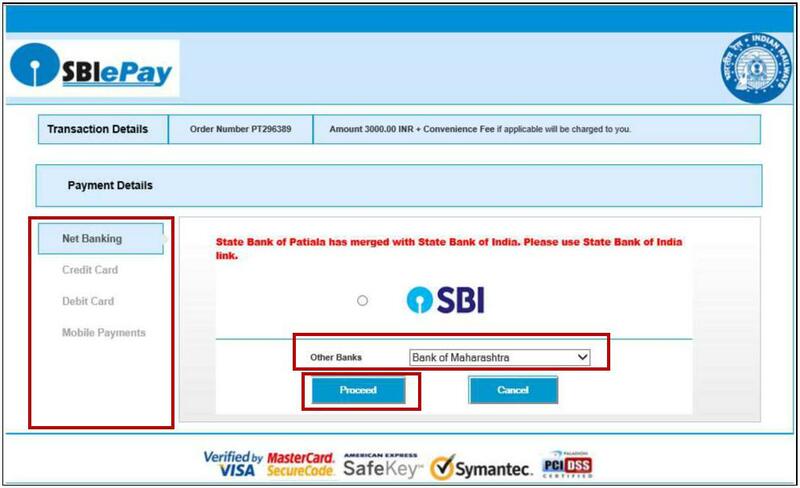 Please Login into your SBI account and follow the on-screen instructions to complete the payment process. After the payment is made you will be taken back to the payment page of IREPS website where the details of transaction made are shown at the bottom of the page. 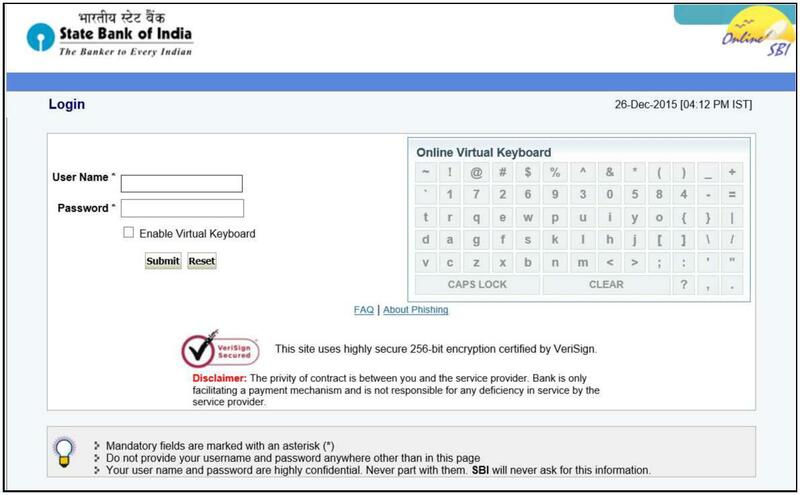 If the online transaction is successful and confirmation regarding the same is received by IREPS from the bank, the Status field will show Success message. Retry message in the Status column indicates that the confirmation is still pending from the bank. The user should click on the Retry link to initiate confirmation process. If success message is received from the bank, the status of transaction will change to Success. If the transaction has failed, the status will change to Failed, and the user will have to make another attempt for payment. If the confirmation is still not received the status will remain as Retry. The user can hit the Retry button again to initiate confirmation process. Retry option is available only seven minutes after the transaction is made. If the transaction is not getting updated even after three retry attempts, the user has a choice to make another payment. This option should be used only if the tender is about to close. If more than one transaction is successful, refund will be made as per the refund policy. Please see terms and conditions for online payments for more details. 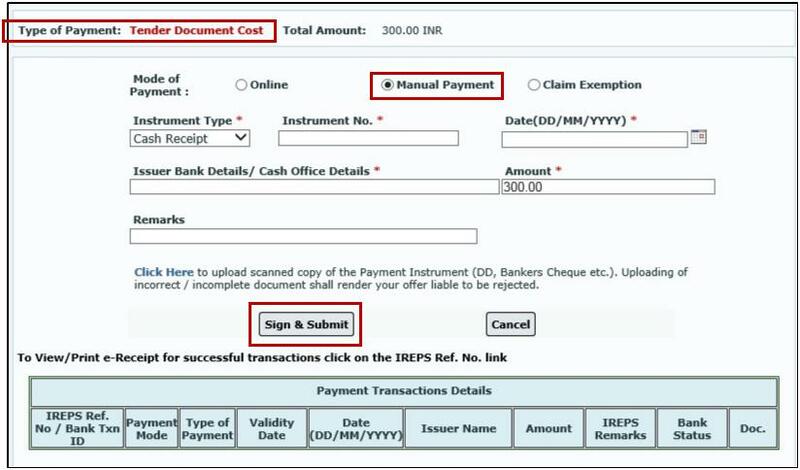 Please select the Instrument type (Banker’s cheque, DD etc.) through which manual payment has been made, enter the instrument number (Banker’s cheque number, DD number etc. 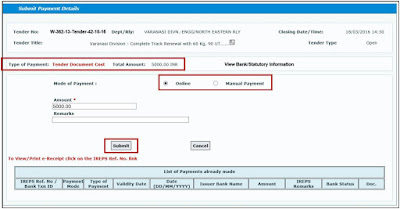 ), the date of instrument (Banker’s cheque date, DD date etc. ), Issuer Bank/Cash office details etc. in the relevant fields. The bidder can now proceed for EMD payment by clicking on Submit EMD button. The details of all previous payment transactions are shown in the bottom pane of the page. The uploaded document, if any, can be viewed by clicking on the view icon. Several categories of vendors like MSME firms, Firms registered with the zonal railway for the tendered item, Firms approved by RDSO/ PUs etc. for the tendered item etc. are exempt from payment of either Earnest Money or Tender Document Cost. Such bidders can claim exemption by selecting the Claim Exemption option on the payments page. Bidders are advised to read the tender documents carefully and satisfy themselves about their eligibility for such exemption as is being claimed, as claiming exemption wrongly may render their offer liable to be ignored. Please select the applicable exemption category / subcategory and then click on the Click Here link to upload the supporting document for claiming exemption. The process of uploading document and then submitting the other details is the same as explained for uploading of documents and submission of details for manual payments. 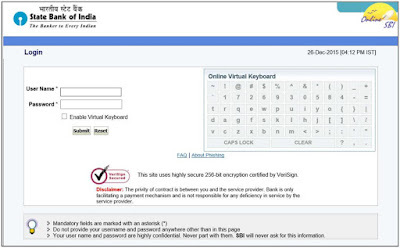 How to Login into IREPS Application as a Vendor? What is the Significance of the Different Blocks of the Tender Document? 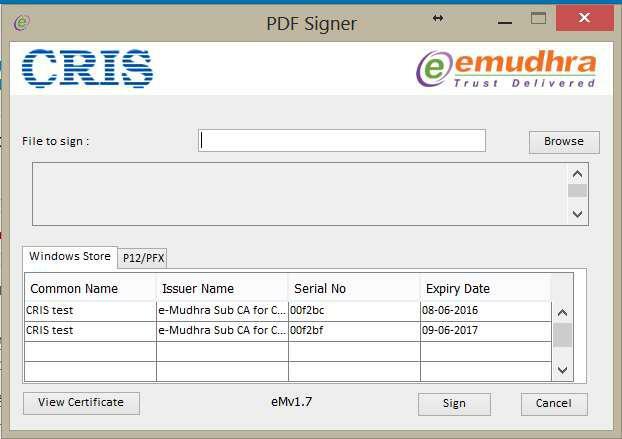 How to View corrigendum List Issued in a Tender? How to Submit a Revised Offer? How to View Offers and Tabulations of a Tender? How to View Negotiation Letter and Submit Negotiated Bid? How to View Counter Offer and Reply to Counter Offer? How to View Letter of Acceptance? How to Reset Password using Digital Signing Certificate (DSC)? 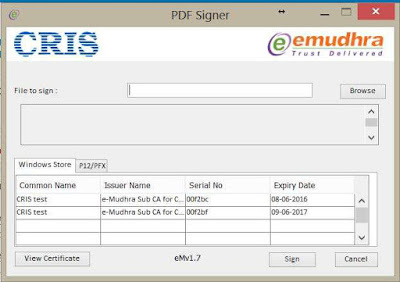 How to Change Digital Signing Certificate (DSC) of a User?